Griff joined me to weed the rose garden - which means I pulled crabgrass until my hands were sore, and Griff begged for jobs to do, turned them all down, then pleaded to be allowed to use the hose to squirt anything that stands still. Griff: "Mom, I can prove that fairies are real!" Griff: "I can SHOW you a fairy." Me: (impressed that he's starting to grasp the idea of concrete evidence upon which to base belief) "Ok"
He squirts the hose. I'm on the other side of the yard. I know what he's looking at but cannot see it. I encourage him to adjust his position until I can see it, too. The sun is behind us and the mist refracts the light into a slice of rainbow. It's science, or fairy magic, or both. I miss being five. Being the mom of a five-year-old is almost as good, though. I get to know the science *and* see his wonder *and* teach him how to cherish both. Fairies have been a theme for us since the winter, when Griff announced that fairies are really real and that they eat red berries. The girls told him so. Through the winter and spring we have heard similar claims. Fairies are really real, they left fairy dust in the forest, the girls saw it. Fairies are all girls except for just one boy fairy. You think so, Griff? "I know so, the girls told me." "The girls" are a group of girls in his class, and they are apparently the leading experts in fairy lore. I've waffled between teaching him to question authority and taking the stance that trusting the expertise of women is an important life skill for a young man to attain. At any rate, Griff mentioned some books which the girls frequently consult. What are these tomes of fairy knowledge? I wondered if they were the Barbie fairy books or the newish Pixie Hollow fairies based on Disney's Tinkerbell. I listened for clues - Griff brought home a homemade sock doll that he had created and named Ruby Redfairy. I later learned that "the girls" had also created a collection of dolls, all with color names. 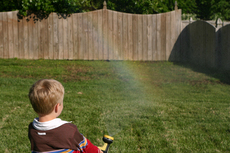 The crystal I had hung in his bedroom to catch the evening sun was no longer an amazing science experiment; the bits of color on the walls were rainbow fairies, and Griff was more excited than ever to see them. Darker characters came into the story. Griffin came home from school one day and woefully informed me that the fairies were all DEAD. They don't know how it happened, but the girls think Jack Frost and the Goblins were behind it. Jack Frost? Wait, did I mistakenly send Griff to the Waldorf school? And my goodness to fairy assassination. Sounds like the fairies never took Defense Against the Dark Arts. Wait, wrong mythology. I googled around and discovered the Rainbow Magic books, an import from the UK. Oh, the relief. Wholesome, not-so-branded, not-Barbie, not-Disney, not-made-for-TV early reader books. This is an infatuation I can support without reservation. I read the first one in the series while hanging out with Reese in Barnes & Noble. Not classic literature, but not absolute garbage, either. So we're reading the Rainbow Fairies - you can cover a book in about half an hour to 45 minutes, nice for a longer bedtime story. I'm eager to find out how Fairy Land will be freed from the horrible spell Jack Frost cast. No dead fairies so far. I'm fairly sure that one sprung fresh from the minds of fairy-obsessed five-year-olds. "When did you start believing in fairies???" Griff, the question is not when we start believing, but when we stop, and what that means for us. Do we need to believe in magic to have a sense of wonder? Can we enjoy fantasy after learning the truth? Can the truth lead us to new wonders? For now, we'll enjoy our summer of the fairies. Griffin and I have planned part of our garden as a fairy haven and have several fairy-inspired projects in mind. We'll update you as the magic unfolds.